In a large soup pot, heat vegetable oil over medium high heat. Add bacon and cook bacon until crisp, about 5 minutes. Drain fat, leaving 2 tablespoons of bacon fat in the pan. Season chicken with 1 teaspoon House Seasoning Blend; Add chicken and cook over medium heat until no longer pink, about 6 minutes. Add onion, celery, carrots and peppers and season with 1 teaspoon House Seasoning Blend; Saute for 2 minutes, or until tender. Add half and half, potatoes and remaining teaspoon of House Seasoning Blend. Bring to a boil, reduce heat to medium low, cover and cook over for 12 minutes. Meanwhile, puree 2 cups of corn in blender. 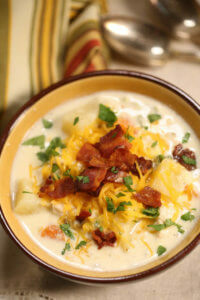 When potatoes are tender, add pureed corn and whole corn to chowder, along with half of the cooked bacon. Top with remaining bacon and shredded cheese.